46 - 48 Belfast Road, Lisburn. 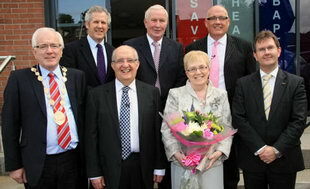 Church interior At the launch of the new Lisburn City Elim Church Complex in September 2009 are L to R: (front row) Councillor Allan Ewart (Mayor), Pastor Norman Christie, Mrs Doreen Christie and Lagan Valley MP, Jeffrey Donaldson MLA. (back row) William Shannon (Architect), Pastor Eric McComb and Pastor John Glass. Members of the Church Session pictured at the launch of the new Lisburn City Elim Church Complex in September 2009 are L to R: Stephen McLoughlin, Tom Tate (Finance Officer), Pastor Norman Christie, Kyle Moore (Church Secretary) and William Kirkwood Paul Smyth. Missing from the photo is George Robinson. The witness of Lisburn Elim Pentecostal Church began officially in January 1921 using rented accommodation. The fellowship obtained a piece of ground in Wallace Avenue in January 1924 and shortly afterwards a building was erected that housed the fellowship for nearly sixty years. Under the leadership of Pastor Jim Atkinson, the Church Session decided to purchase the Church of Christ building on the Belfast Road. The building, which had been erected ten years earlier, still required work for completion. The new premises were officially opened in November 1984. The outreach ministry of the church was greatly enhanced by the construction of a large garage in 2005, which accommodates the two minibuses and a caravan required for street evangelism. In December 2008, work began on a new building project involving the extension of the main church and minor hall, the creation of a glass prayer tower and top storey for youth work, installation of stained glass windows, and a modern audio-visual studio. 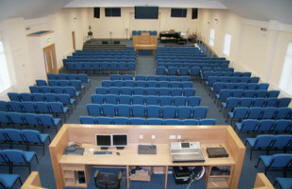 The new church complex was officially opened on Saturday 5th September 2009. The present Pastor, Norman Christie, was inducted here in May 1993. 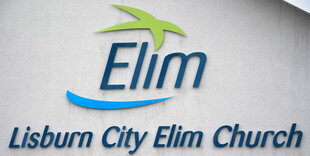 The witness of Lisburn Elim Pentecostal Church began officially in January 1921 using rented accommodation. The fellowship obtained a piece of ground in Wallace Avenue in January 1924 and shortly afterwards a building was erected that housed the fellowship for nearly sixty years. Under the leadership of Pastor Jim Atkinson, the Church Session decided to purchase the Church of Christ building on the Belfast Road. The building, which had been erected ten years earlier, still required work to achieve completion. The new premises were officially opened in November 1984. The present pastor, Norman Christie, was inducted here in May 1993. The outreach ministry of the church was greatly enhanced by the construction of a large garage in 2005, which accommodates the two minibuses and a caravan required for street evangelism. In December 2008, work began on a new building project involving the extension of the main church and minor hall, the creation of a glass prayer tower and top storey for youth work, installation of stained glass windows, and a modern audio-visual studio. The official re-opening of the premises is scheduled for Saturday 5th September 2009.